You know what a meme is, but do you know how easy it is to make one? This one took two minutes . Here are some sites that provide basic and trending images along with the ability to caption, animate, and download them. imgflip.com: gives you the quick options to create a meme, a gif, or a funny pie chart. No sign up necessary! And here's an article from the MLA on how to properly cite them! psst... memes are a visual way people share information and express themselves on social media, often in a humorous way. Albany, NY Suffrage Parade Forming at City Hall, June 6, 1914. Courtesy of Albany Public Library. The South Central Regional Library Council and the Empire State Library Network have created a New York Heritage exhibit, Recognizing Women's Right to Vote in New York State which charts the development and evolution of the Women's Suffrage movement in New York State. This program was funded in part by a Humanities New York Action Grant. Have you ever found an image on the web and wanted to find out where else it was used? You can do a reverse image search by clicking on the images tab on Google's home page, clicking on the camera icon in the search bar, and either uploading an image or insert an image address (right click on an image and click copy image address to capture its URL). And, if you're in Chrome, you can just right click on an image and you should see an option for Search Google for image. Read this story for more information! Or check out this article to learn a few advanced Google search tips. And in other Google news (and on a slightly creepier note) check out this video where Google CEO Sundar Pichai demos Duplex, their new Digital (AI) Assistant. In the video you will see two phone calls Duplex makes to schedule appointments at a hair salon and a restaurant. What will be the impact of this technology on the reference interview ??? As humans struggle to evaluate and identify trustworthy sources, how will we know when we're talking to a robot when the bot sounds human? Does it even matter? This year's annual meeting brought together representatives from a number of our member organizations for lunch and conversations. It was an opportunity to discuss issues we're currently facing and hear from some great speakers. We'd like to extend a special thank you to our speakers Emily Spinner, Michael Daly, and Judith Wines for talking about how they are positioning themselves to meet their communities needs. Did you know that approximately 80% of visitors to our website come to view our job postings page and more than 50% of them found their current jobs through our postings? If you're currently looking to fill a position at your organization, why not post on our site? The service is free for members and the postings will stay up for at least 1 month. Send a valid URL or a PDF of the job description to jobs@cdlc.org. A reminder that CDLC Interest Groups are open to all members as forums where members can discuss common interests. Learn more about our interest groups. CDLC, in partnership with the public and school library systems, is working with local PBS station WMHT to promote and share information about their Great American Read project. Learn more about the project and what you can do at your library. And congratulations to Greenwich Public Library, a SALS member, who received a grant from ALA to promote the Read in their community! Both Albany County Historical Association as well as Schenectady County Historical Society have received a Strategic Planning Grant in the most recent round of DHPSNY grants. Learn more about DHPSNY's Strategic Planning Curriculum here. The New York State Department of Transportation has joined CDLC as its newest member. We also welcome two new CDLC member directors: Dr. Elizabeth Stack is the new Executive Director at the Irish American Heritage Museum, while Dr. Gina Gould takes over at miSci. Tammy Kelly, former librarian at St. Peter's Hospital, has accepted a new position at the Dickerman Library, a research library for the NYS Department of Health. We wish her the best in her new role! 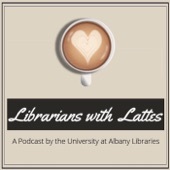 We've mentioned podcasts before but did you know the University Libraries at Albany have created a new series called Librarians with Lattes? There are currently 6 interviews with university librarians intended to connect students with issues in the library community like the open access movement, managing rare manuscripts, and coping with stress during finals. National Library Workers Day is a day for library staff, users, administrators and Friends groups to recognize the valuable contributions made by all library workers. This year's happened on April 9th and there were a few local names on the list. Susan from a public library in Salem, NY , is a Star because She makes the most of her library...[and] is very helpful to her patrons and is very welcoming. Alexandra from a public library in Albany, NY, is a Star because of her dedication to the APL Raising a Reader program, creating more equitable futures for Albany's children! Visit the ALA Galaxy of Stars to read the complete write ups and see what makes our libraries shine. The Joseph F. Shubert Library Excellence Award recognizes a New York State library or library consortium that has taken significant steps to improve the quality of library service to its users. The deadline to apply is August 1. The C. Herbert Finch Online Publication Award recognizes a superior online publication, to include virtual exhibitions, web sites and web pages, which promotes the use of archival materials. The online publication must have been published between July 1, 2017 and June 30, 2018 and been created by an individual or institution in the MARAC region. The deadline to apply is July 31. Two Institute of Museum and Library Services (IMLS) grants have been announced. The National Leadership Grants for Libraries program invests in projects that address challenges faced by the library and archives fields and generate results such as new tools, research findings, or models that can be widely used. The deadline to apply is September 17 . The Laura Bush 21st Century Librarian Program program supports professional development and training projects for libraries and archives. The deadline to apply is September 17. The New York Library Association provides awards and scholarships every year to members of the profession. Documentary Heritage and Preservation Services for New York (DHPSNY) currently offers Planning & Assessment Services in four major areas. These services are designed to support New York organizations in improving and advancing program efforts while forming strategies for future growth and development. Visit their Planning & Assessment page to learn more about each of these services and download application materials. The summer 2018 application review deadline is July 13. The National Library of Medicine (NLM) has announced that they plan to release a new and improved version of DOCLINE this summer (expected launch date in August). The news was announced during an MLA update. You can watch or listen to the video or read the transcript. DOCLINE is the National Library of Medicine's (NLM) automated interlibrary loan (ILL) request routing and order referral system. The 2018 Academic Libraries Conferences will focus on t rends in higher education including open learning, Open Educational Resources (OERs), educational commons, and other notions of openness in academic communities. It is sponsored by the Empire State Library Network, the New York Library Association's Academic and Special Libraries Section, and the Eastern New York chapter of ACRL. During this day-long workshop intended for academic librarians, participants will take a topic they are interested in and turn it into a multi-session course. In the morning we will focus on course development, including determining learning outcomes and scaffolding assignments. In the afternoon we will focus on pedagogy, including creating lesson plans and leading a class session. Thinking About Becoming a CDLC Personal Member? CDLC personal members not only help support the mission and goals of the council, but also receive discounts on most of our events. This is a great option for students, retirees, trustees, friends groups, and transitional library staff to stay connected with the library community. Consider becoming or renewing your tax deductible membership today. Visit our personal membership page or contact Kari Kakeh with any questions.